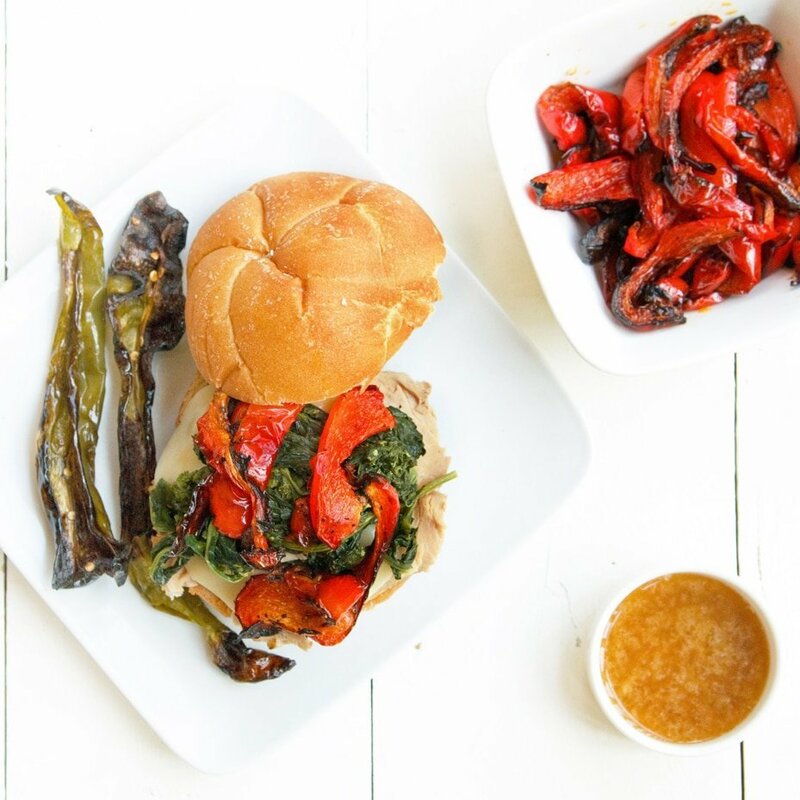 Home » Recipes » Main Meals » Pork » Philly Style Roast Pork Sandwich – The Real Deal! 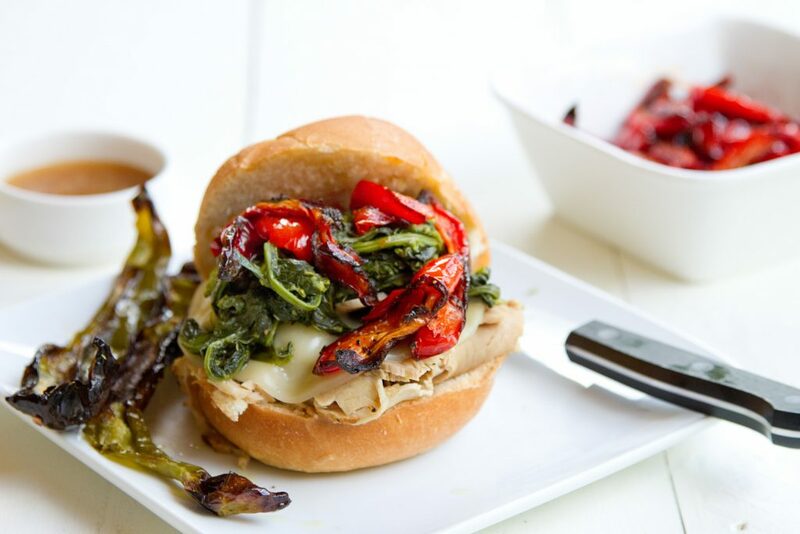 When its time to create deliciousness for lunch think about making my Philly style roast pork sandwich. Just make sure to make enough of these beauties, because everyone is going to be coming back for more! One of the great joys in life is a Roast Pork Sandwich and Philadelphia is renown for having one of the best pork sandwiches in the country! Unfortunately, that doesn’t hold true for many of the restaurants that serve them! I have had a lot of tasteless pork sandwiches where the owners just go through the motions because they feel they have it on their menu. You know, it’s not rocket science people. 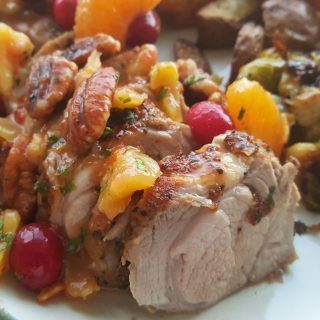 Cooking a pork roast doesn’t have to be complicated! You rub it with brown mustard and hit it with an abundance of Montreal Beef Seasoning and you’ve got one of the most flavorful pieces of pork you could ever hope for. The secret really is all that great cracked black pepper in the Montreal seasoning. Most of the restaurants and taverns that feature a Philly Style Pork sandwich offer it a couple of ways. You can get it straight up with just a slice or two of provolone on it, or you can get it Italian Style which to me is the true Philly Style Roast Pork Sandwich. The Italian Style comes with broccoli rabe (or spinach) that has been sauteed in olive oil with a healthy amount of garlic, roasted red peppers, and aged provolone cheese…..sigh, its a wonderful thing. That is of course if they bother to season the pork and don’t just throw it in the oven! And no self-respecting purveyor of roast pork would serve that glorious sandwich without a side of Italian Long Hot Peppers. Those are the peppers that let you know just how hot they are as soon as you start cooking them, these were no exception! I’m afraid my days of long hots are far behind me, but to be truly authentic you gotta have them! Don’t forget to pick up some good kaiser rolls for this sandwich, and your choice of provolone. I used regular provolone, Lisa just isn’t a fan of the aged provolone, it’s a bit too sharp for her. Of course, I would have used them both on my sandwich, I do love cheese! 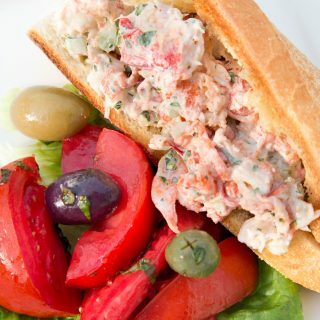 This is definitely a sandwich worth making, your friends and family will absolutely love you for making it! It’s also a great way to have some fast food in your freezer. There is just the two of us at home, so when I make this type of roast pork I freeze what we don’t eat into portions that we can reheat for dinner another night. I also keep extra Kaiser rolls in the freezer and you know you can always find a large variety of cheese in my fridge, and provolone is usually one of them! So dinner on a hectic night just got easier! 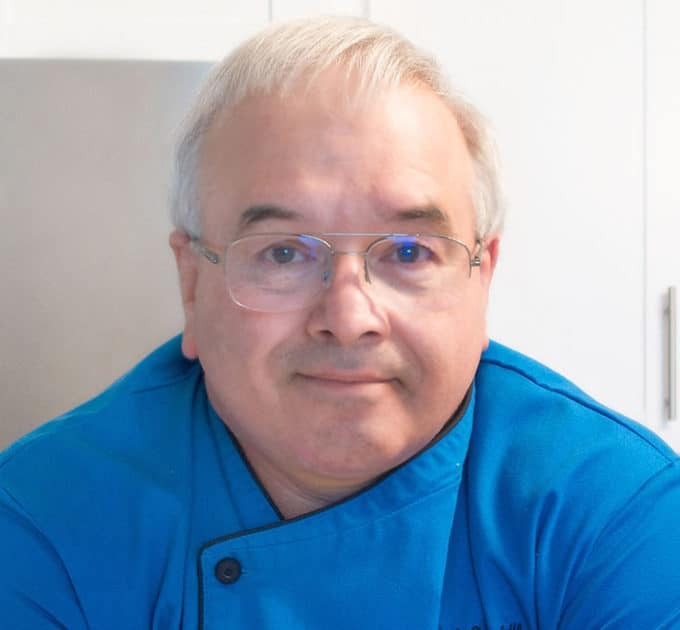 If you’ve tried my Philly Style Roast Pork recipe or any other recipe on askchefdennis.com please don’t forget to rate the recipe and let me know where you found it in the comments below, I love hearing from you! You can also FOLLOW ME on Instagram @chefdenniseats and @chefdennistravels, Twitter and Facebook. Coat top side of pork roast with brown or deli mustard, rub into meat. Sprinkle a liberal amount of Montreal Steak Seasoning over the mustard, covering the top completely. After the Pork has cooled completely cut it into thin slices to re-heat in the au jus. Add some water to all of the meat drippings and use this as your base for the pork au jus. Wash and trim the broccoli rabe removing any bad leaves and cutting off the stems, leaving only the leaves and flowers. Drain Broccoli rabe and saute in olive oil with chopped garlic, sea salt and pepper to taste. Wash peppers, and cut down the center removing all the seed and membranes. Keep the peppers separate during the process, otherwise the long hots will make everything hot! Combine paprika, crushed black pepper, kosher salt, granulated garlic, granulated onion, crushed coriander, dill, and crushed red pepper flakes, mix well. 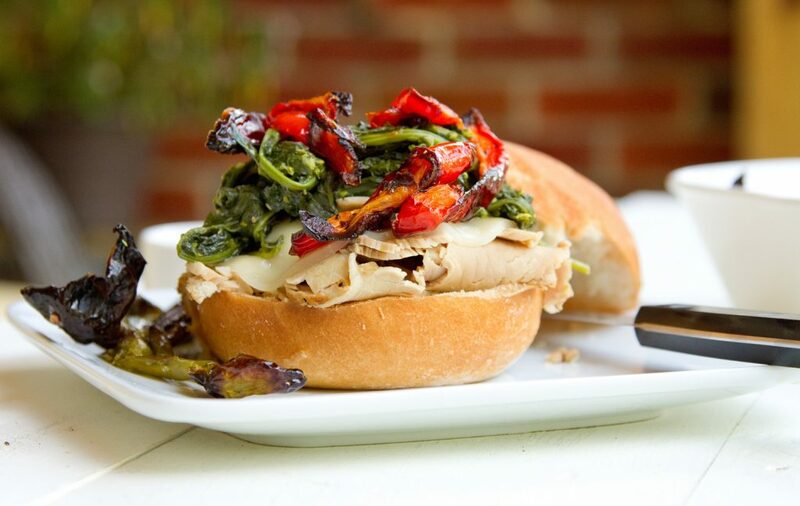 place slices of roast pork on kaiser roll, add provolone, broccoli rabe and roasted red peppers. serve with extra au jus and long hots! Previous Post: « Are You an Early Bird? Get Your Mornings Started with Crazy Good Coffee at RaceTrac! I am still laughing about the salad comment, and with that…… The Tiramisu is in the refrigerator chilling, I had to make it. The marscapone mixture is heaven. I am so glad that I stumbled onto your site, the recipes are meraviglioso! I’m very happy you stumbled upon my site as well Gloria and thank you for trying my recipes and leaving your feedback, I truly appreciate your comments! no lid on the pork. It is a delicious way to have the pork, it really was such a nice variation. 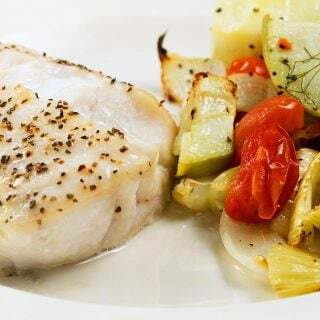 Florida sounds wonderful at this time of year and what better way to enjoy than with great food. Ok, now I tried your Biscotti recipe, I think I have to stay away from your website as it is dangerously good! My husband is not a fan of biscotti, especially anything with fruit, so I changed the nuts to almonds and added chocolate chunks, he ate the whole batch. The original recipe I enjoyed myself , they were not too hard, had a wonderful taste, one of the best Biscotti’s I have had. I have to pace myself visiting this site, its a vision of lovely delights! Those are my favorite biscotti Gloria and you reminded me I haven’t made them in awhile! I do have some salads too…lol! I made your recipe for the Philly style roast pork sandwich, it was beyond wonderful! My husband kept going to the kitchen and smelling the aroma, he was going insane . We really enjoyed your recipe and thank you for sharing this with everyone. I had one question, I used a bone in loin roast, it was hard to slice into thin slices, would you recommend a boneless roast? I was afraid of loosing moisture to the meat without the bone. I was raised in Philadelphia and I never had one of these sandwiches, I truly miss the area , thank you again for sharing the recipe it brought the comforts of Philadelphia to my home. 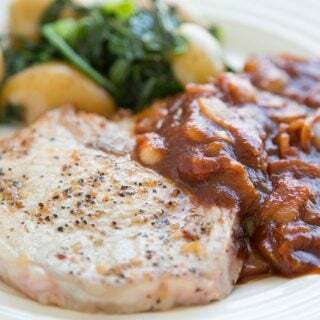 It is such a delicious way to make Pork Gloria, I can’t wait to cook up another batch now that I’m in Florida! Thanks so much for letting me know you enjoyed it and yes I would try a pork loin roast that was boneless. It’s better (and more authentic) to use pork shoulder. The loin’s a bit devoid of porky fat and flavor. I just pulled my pork out of the oven after 1 hour 5 minutes of cooking. I think that 2 hours is an overstatement but just go by your thermometer. It wasnt quite done but warming it up in the jus brought it to temp. thanks Andrew, everyone’s oven is a little different too, and it depends on the size of your pork roast. But like you said using a thermometer is the best way to go. This is my favorite sandwich, ever. I never thought to season it with brown mustard… I’ll have to try it your way! I’m not normally a fan of a strong mustard flavor, but it’s probably good with the Montreal Steak Seasoning. I really need to make this. Like soon. Like really soon. Like now. what a great idea of giving seasoning mixes for Christmas! and of course its okay to mention me! 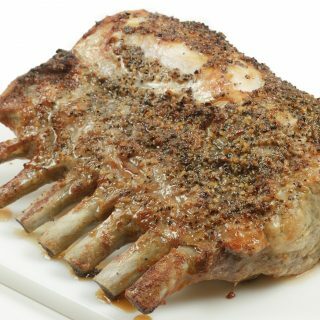 I´ve recently discovered slow roasted spiced pork and can´t think of any other way or cooking it to make it so flavorful. This sandwich is just fantastic, with mustard and provolone (a great cheese with any meat)! Chef! It feels like 100 years since I’ve been able to comment on posts, but at last I have found myself in a moment of fewer than usual interruptions, and must say this looks fantastic…it is italian style all for me. I also have to tell you how much you had me laughing at your “Lord of the Blossoms” reference…you are a crack up. I sure have missed posting on your blog and am sending you BIG BIRTHDAY WISHES today…may the Lord bless you and keep you, make His face shine upon you, and give you peace. I’m so thankful to have friends like you in my life, blogging has been a blessing. Excellent pulled pork and good idea to freeze the excess. I’ll be trying the Montreal seasoning. Now that’s a sandwich! A damn good looking one too. I love the peppers and the roll. Now I need to make me one. I live in Philly and have had the award-winning ones, as well as many other Philly pork sandwiches, and I totally vouch for your version. It looks like i just got it from DiNic’s in the Reading Terminal or John’s on Weccacoe Street and that’s heavy praise, but you earned it! Thanks Helene, I’ve learned from some of the masters in the area of how to do it right! Gorgeous sandwich Chef! And you just gave me an idea what to do with that load of leftover pulled pork I have sitting in my fridge. i don’t know why anyone, if offered the opportunity to choose between ‘plain’ and ‘italian style’ anything, would ever opt for plain. beautiful sandwich chef! That is one gorgeous sandwich, Chef! Definitely make mine Italian style. I can just imagine what all of those flavors would take like together. This is what I need tonight. I love the Italian style Philly steak sandwich with vegetables. It just gives you a complete dish with veggies, protein and starch. When I first say the word Philly in your post, I thought to myself, hum. 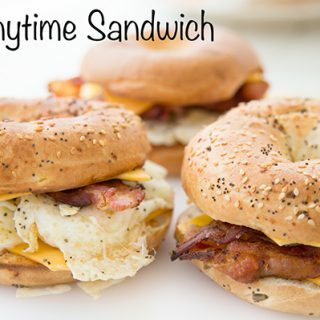 After reading about the sandwich, wow, I can’t wait to make this for the hubby! We’re both big fans of anything that resembles Mediterranean food- the peppers, tomatoes, garlic, cheese. I just harvested the last of my Fresno chilis, might just be perfect for this, will give it a real kick. Reading Terminal Market has one of THE best pork sandwiches I have ever had. It comes with the broccoli rabe. SO good! This looks amazing chef! We love Montreal Steak seasoning – and you have a recipe! Awesome! The pork sandwich looks amazing and your photos are delicious too! This looks beautiful–I can’t wait to try it! Great looking sandwich Dennis. I didn’t realize Philly was also famous for pork sandwiches. Since Montreal Steak seasoning is our go-to for beef, I appreciate the recipe and wil make up a batch. Thank you for including the homemade Montreal Beef Seasoning recipe, too — can’t wait to try it! This is giving me some serious cravings for Pat’s cheesesteaks! Beautiful job!! What a sandwich, I love all the toppings you added. Beautiful pictures! I’ve never seen a Philly that looked anything close to this delicious. I am completely impressed. Your photography is gorgeous in each of these shots too! That just looks wonderful, Dennis! And I love your idea about freezing leftovers in servings for 2. I definitely want to give this a try sometime.